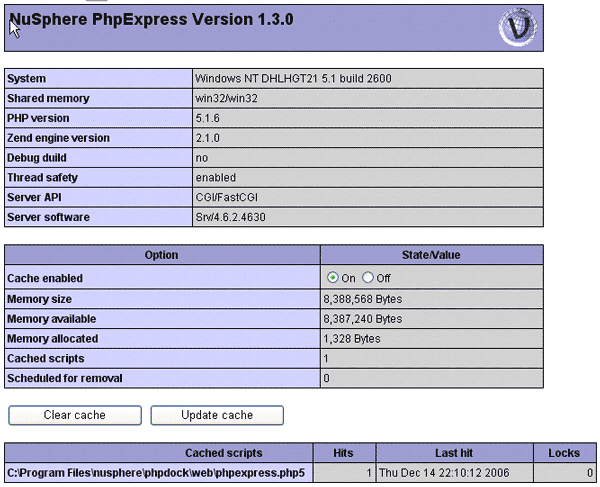 PhpExpress is NuSphere Free PHP loader and accelerator that provides support for encoded files and also speeds up the execution of regular PHP files. Please note that if you are using PHP files encoded with NuSphere NuCoder PhpExpress is required to be installed on the server. When PHP interpreter executes any PHP script it first compiles the script into bytecodes. However NuCoder produces PHP files that have been already compiled into bytecodes. PhpExpress can be downloaded from NuSphere website and distributed Free Of Charge without limitations. Every NuCoder installation also comes with PhpExpress. Once PhpExpress is installed on the server, you can execute PHP Scripts encoded with NuCoder as well as regular, not encoded PHP scripts. In both cases you will gain an improved performance in the execution of the scripts. Please note that PHP caching is only enabled when PHP is running as an extension of the Web Server - dll on windows or shared object on Linux/Unix/Mac Operating Systems. Caching of PHP scripts when PHP is running in CGI mode is not useful and therefore disabled.